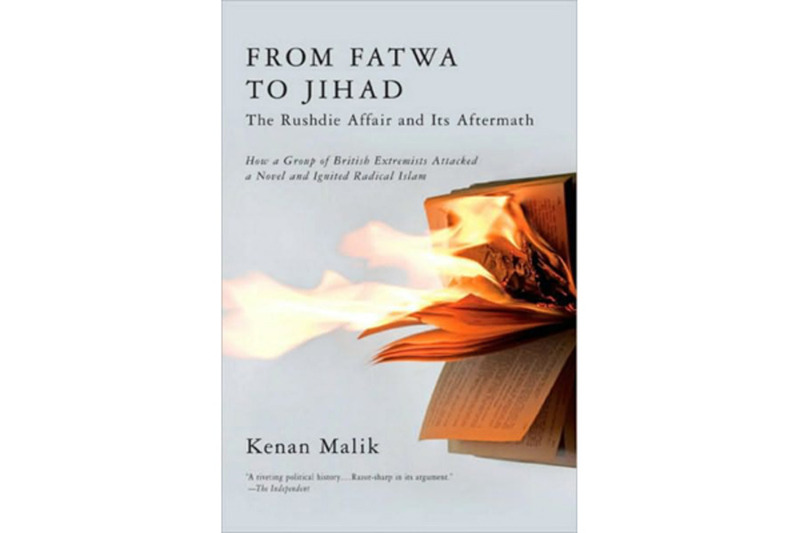 Kenan Malik’s latest book From Fatwa To Jihad: the Rushdie affair and its legacy distorts anti-racist history and plays into the hands of today’s anti-Muslim politics. During the 1980s, Kenan Malik was active with an organisation called East London Workers Against Racism (ELWAR). In response to racist violence, ELWAR organised street patrols and ensured the physical protection of families under attack. Malik thus spent much of 1984 camped out in a house in London’s East End defending its residents from racists. Nowadays, Malik is better known as a commentator on race issues and a mainstream media pundit. According to his latest book, From Fatwa To Jihad: the Rushdie affair and its legacy (Atlantic Books, 2009), multicultural policies are to blame for fostering a sense of ‘tribalism’ in British society, for the growth of ‘radical Islam’, for censorship of the arts and for the cultivation of a bogus notion of minority victimhood. The book is not so much about the fatwa against Rushdie or 7/7; rather he uses these two events to narrate a shift he believes has occurred over the last twenty years in Britain: from anti-racism to multiculturalism, from universalism to identity politics and from issues of politics to issues of culture. What results is an often mystifying mix of anti-racist history and journalistic cliché, with parts of From Fatwa To Jihad reading like a Left pamphlet from the early 1980s and other sections regurgitating the half-truths and conventional wisdoms of Nick Cohen, Andrew Anthony and Trevor Phillips. What distinguishes Malik’s book from others in the ‘crisis of multiculturalism’ genre is his attempt to appropriate anti-racist history itself for this discourse and thus to give an anti-racist rather than merely liberal endorsement to the current attack on multiculturalism. In doing so, Malik draws, sometimes disconcertingly, on the same political traditions of radical anti-racism with which the Institute of Race Relations (IRR) has long been associated. Yet, he not only distorts those traditions; he also ends up reinforcing notions of liberal integrationism that are central to today’s anti-Muslim racism. From the 1980s, says Malik, fuelled by collusion between the state and opportunist religious and cultural organisations in minority communities, there was a rise in ethnic identity politics. From the state’s point of view, multicultural policies were introduced as the most effective way to manage the discontent that racism produced. From the point of view of self-appointed community leaders, ‘ethnic’ funding was a golden opportunity to finance pet projects in the name of specific cultural needs. Multiculturalism thus served as a diversion from the anti-racist politics of the time – for example, the Asian Youth Movements (AYMs) that had sprung up in the late 1970s and which were less interested in having Asian culture officially recognised than in fighting state racism and racist violence. Moreover, the idea that each ethnic or religious group had its own unique and distinctive identity that needed nurturing led to segregation and, ultimately, inter-ethnic hatred and violence. Such arguments would, of course, be familiar to anyone who read A. Sivanandan from the 1980s onwards. Malik, however, deploys them without any acknowledgement of their origins. Moreover, the way in which he reinterprets them for the current context takes him onto new and dangerous terrain. Whereas for Sivanandan, the anti-racist critique of multiculturalism is, first and foremost, directed at its denial of the political reality of racism, for Malik, the objection to multiculturalism is more that it fosters an illiberal Asian culture that is out of step with modernity. For Sivanandan, what matters is how culture is politicised: does it divide and ossify or is it, as Amilcar Cabral put it, a ‘combusting force’? For Malik, on the other hand, politics must be rigorously policed for any intrusion of ‘culture’ at all. This leads Malik to claim that, for Asians, the issue today is whether ‘second-generation migrants’ are able to throw off ‘their parents’ cultures and traditions’; failure to do so, he says, leaves them ‘adrift’. Moreover, Malik argues that racism is no longer a problem that Asians face. He thus echoes the argument of US neoconservative Dinesh D’Souza’s 1995 book The End of Racism: it is not society that needs to be less racist but minorities who need to be more liberal; there are no racist barriers to lower, only non-white individuals who need enlightening. It is a position which Malik will, of course, find easier to sell to his editors than his older anti-racist radicalism. ‘There is,’ claims Malik, ‘no evidence of any kind of systematic targeting of minorities of the kind that was common in Britain just twenty years ago.’ Incidents of racist harassment are ‘so rare that every one makes a national headline’. He contrasts this with the late 1970s and 1980s, writing that in the ten years from 1978, there were forty-nine racist murders. No doubt readers of IRR News will know that, every week, racist attacks take place that are barely reported, even in the local press. It is worth adding that in the ten years from 1998, the IRR recorded sixty-eight deaths with a known or suspected racist element. Even allowing for different methods of recording, this hardly suggests that Britain has solved its racism problem over the last twenty years. On the question of a specifically anti-Muslim element to contemporary racism, Malik is even more in denial. Negative discrimination against Muslims barely exists as a social reality, he says. Indeed, ‘if Muslims are singled out in Britain, it is often for privileged treatment’. The real problem, he says, is not discrimination but the ‘desire to play the victim’. While the existence of racism once made a desire for community-specific political movements such as the AYMs ‘understandable’, today, states Malik, they lead directly to ‘tribalism’. He writes about his friend Hassan, who, in response to racism, drifted from secular Leftism into Islamic identity politics. Hassan knew nothing of the Qur’an but ‘anger about racism created in him resentments towards British society out of which radical arguments about the Muslim community could breed’. His drift towards Islamism, which began with the Rushdie protests, was thus rooted in injustice. Yet Malik refuses to countenance that what was true of his former comrade Hassan might be true also of young Muslims today. Insisting that there is no longer any racism to fuel identity politics and that imperialist wars are not really imperialist, Malik argues that the ‘rage of Islam’ is a self-sustaining ‘culture of victimhood’ which has detached itself from any real political injustice and is sustained by the currency multiculturalism gives to ‘offence’ and ‘grievance’. For Malik, the problem with multiculturalism is that it gets in the way of freeing Asians from their ‘traditional cultures’ so that they can be fully integrated into Europe’s liberal values. He takes the essence of progressive minority politics in this ostensibly post-racist era to be the critique of Muslim and Asian identity. Rushdie’s Satanic Verses is regarded as an exemplar while multicultural notions of cultural and religious sensitivity are seen as unwelcome restraints on such a politics. He argues that the Satanic Verses affair marks the beginning of a change in attitudes towards freedom of expression, which has resulted in the ‘criminalisation of criticism of Islam’. The demands for censorship which, he says, some Muslims have made has ended up backfiring as Muslims themselves now find themselves criminalised for their opinions. As his own examples illustrate, though, the only cases in which a person’s freedom of expression has actually been criminalised have been Muslims considered by the state to have ‘unacceptable opinions’. Yet, for Malik, these are not examples of ‘targeting a minority’; rather the real story is that the ‘fatwa has become internalized’ so that writers and artists are no longer free to criticise Islam. The media class, it seems, has its own ways of ‘playing the victim’. The attack on multiculturalism was once a progressive stance within a radical anti-racist framework. But to abstract that position from its historical anti-racist context and apply it in today’s different circumstances is to end up endorsing, effectively, the French republican model of assimilation, with its fear of minority culture as a threat to its superior values and its denials of the continued existence of racism. Whereas twenty years ago, minority and majority ‘cultures’ were still regarded by the state as a means of stabilising political conflicts of race and class, today ‘culture’ and ‘religion’ are the vectors of new liberal racisms, the symbols of all that is threatening in the non-western world. Liberal anti-multiculturalism now serves, by default if not intent, to reinforce the ideological underpinnings of today’s racism and imperialism. Malik claims the radical mantle of the AYMs. Yet their true heritage lies in those who continue to do grassroots support work for victims of racism outside of the glare of the media. Malik, on the other hand, in his journey from East End anti-racist to West End anti-multiculturalist has completely converged with the status quo. Originally posted at the Institute of Race Relations site. Whereas twenty years ago, minority and majority ‘cultures’ were still regarded by the state as a means of stabilising political conflicts of race and class, today ‘culture’ and ‘religion’ are the vectors of new liberal racisms, the symbols of all that is threatening in the non-western world. end up endorsing, effectively, the French republican model of assimilation, with its fear of minority culture as a threat to its superior values and its denials of the continued existence of racism. I know this was written in 2009, but in his essays at least that isn't his position. I def remember an element of that kind of 'assimilationism' in Fatwa to Jihad, a lot of focus on treating people (and expecting them to behave) as British citizens rather than 'encouraging' Muslim/whatever identity politics..
fwiw, I actually quite like Malik and his critique of multiculturalism but in a lot of ways his criticism is just the reflection of (and so just as daft as) people who say multiculturalism is great coz curries.. I read Malik's book many years ago so can't refer to any details but I encourage anyone who hasn't read it to do so. He makes a good argument for the importance of the Rushdie case in shaping not just British but transnational Islamism. I don't think he downplays racism. He argues against the view that there's a war against Muslims and that Islamophobia as distinct from racism is the main threat to migrant and Black people. Racism is certainly alive and kicking. He makes a distinction between the multiculturalism as lived diversity (we like curries) and multiculturalism/multifaithism as state policy to manage BME communities (separate youth projects and women's shelters for different faith communities). Ultimately Malik is a liberal, arguing for secular democracy, but to me (this book at least) is far more worth reading than Kundnani, an anti-imperialist leftist supporter of the Muslim Brotherhood and Jamaat in their British incarnations as well as CAGE and other apologists for Islamism. Haven't read recent book, but I've read an article where he argues that today's young Islamists are heirs to the antiracist struggles of the 70s and 80s and therefore must be supported uncritically. The IRR has gone in that direction generally, making tv programmes on antiracism for the Iranian state Press TV for example.